Mammary gland, Arteriole - Necrosis in a female F344/N rat from a subchronic study. Loss of cells in multiple arteriolar segments is apparent (arrows). Mammary gland, Arteriole - Necrosis in a female F344/N rat from a subchronic study (higher magnification of Figure 1). Loss of cells and disorganization of the wall of multiple arteriolar segments is apparent (arrows). 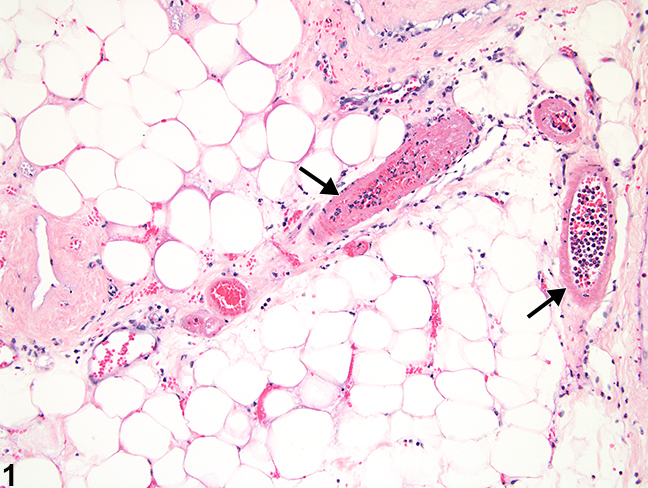 Necrosis of blood vessels ( Figure 1 and Figure 2 ) in laboratory animals is most often seen as one component of the spectrum of lesions of polyarteritis and is rarely present as an individual lesion without other associated changes. Distinguishing between vascular necrosis resulting from spontaneous polyarteritis nodosa and necrosis resulting from compound administration may be difficult (see Blood Vessel - Polyarteritis Nodosa for a description). 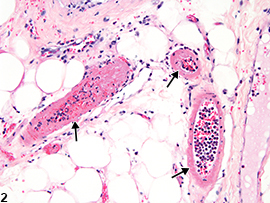 Necrosis generally affects the tunica media of small to medium-sized arteries. Affected vessels have decreased numbers of cells, either segmentally or circumferentially. The walls of affected vessels are generally more eosinophilic and often have a homogeneous appearance. Degenerate collagen and smooth muscle contribute to the increased eosinophilia. With time, lesions of vascular necrosis are generally accompanied by an intense inflammatory infiltrate and may give rise to thrombi. Administration of cardiovascular drugs such as vasodilators and vasoconstrictor substances may also cause medial necrosis of the same vascular beds. The anatomic location of arterial necrosis differs with the type of compound administered. Vascular necrosis should be diagnosed and graded whenever present, unless is considered a component of polyarteritis nodosa (see Blood Vessel - Polyarteritis Nodosa). The organ in which it occurs should be recorded as the site, and the type of vessel affected (e.g., arteriole, vein) should be indicated using a site modifier. If the type of blood vessel cannot be determined, the site modifier "blood vessel" may be used. Lesions in protocol-required great vessels, such as aorta, should be recorded with the blood vessel as the site (e.g., Aorta - Necrosis). Grading should be based on the number of vessels affected in the organ and the extent of the lesion. If the necrosis is thought to be secondary to another lesion in that organ (e.g., inflammation), or if it is part of a larger necrotic lesion affecting the organ, vascular necrosis should not be diagnosed separately unless warranted by severity. Greaves P. 2007. Histopathology of Preclinical Toxicity Studies, 3rd ed. Academic Press, San Diego, CA, 297-305. Kojimahara M. 1985. Age-induced changes in the aortas of rats. Exp Pathol 28:191-195. Maxie MG, Robinson WF. 2007. Cardiovascular system. In: Jubb, Kennedy and Palmer's Pathology of Domestic Animals, Vol 3, 5th ed (Maxie MG, ed). Saunders Elsevier, Edinburgh, 69-70. Mitsomori K. 1990. Blood and lymphatic vessels. In: Pathology of the Fischer Rat: Reference and Atlas (Boorman GA, Eustis SL, Elwell MR, Montgomery CA, MacKenzie WF, eds). Academic Press, San Diego, CA, 477-478. Nyska A, Jokinen MP, Brix AE, Sells DM, Wyde ME, Orzech D, Haseman JK, Flake G, Walker NJ. 2004. Exocrine pancreatic pathology in female Harlan Sprague-Dawley rats after chronic treatment with 2,3,7,8-tetrachlorodibenzo-p-dioxin and dioxin-like compounds. Environ Health Perspect 112:903-909. Yuhas EM, Morgan DG, Arena E, Kupp RP, Saunders LZ, Lewis HB. 1985. Arterial medial necrosis and hemorrhage induced in rats by intravenous infusion of fenoldopam mesylate, a dopaminergic vasodilator. Am J Pathol 119:83-91.